After a serious car, truck or motorcycle accident, there's no need for you to deal with the insurance company on your own. You already have enough on your plate — medical bills, the financial repercussions of being forced to miss work while you recover, damages to your property, and you shouldn't disregard the emotional, psychological and physical pain and suffering you and your family may endure. It's with all these factors in mind that our team at LeViness, Tolzman & Hamilton, P.A., provides the compassionate legal counsel and representation accident victims and their families need to understand what they're up against and pursue maximum compensation. We know that there are plenty of options when it comes to choosing an attorney. Our proven, trial-tested methods have secured more than $100 million in awards and benefits for our clients. We have achieved numerous successful outcomes at trial. Furthermore, our skill and accomplishments have been recognized by others in the legal community, including: being listed among the Top 100 Trial Lawyers, as a Top Lawyer in Maryland, recognitions in Super Lawyers magazine, and as a 10 Best in Client Satisfaction by the American Institute of DUI/DWI Attorneys. We are also members of numerous legal and professional organizations, including the National Association of Consumer Bankruptcy Attorneys (NACBA) and the National Organization of Social Security Claimants' Representatives (NOSSCR). Furthermore, our staff routinely gives back to our local communities by serving on various charitable and corporate boards. 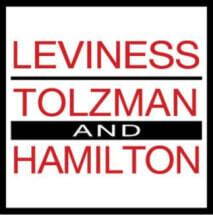 When you need legal representation, reach out to us at LeViness, Tolzman & Hamilton, P.A., to learn how our team of litigation attorneys can help. With offices in Baltimore, Columbia, Glen Burnie and Towson, we are conveniently located to prospective clients throughout the state.